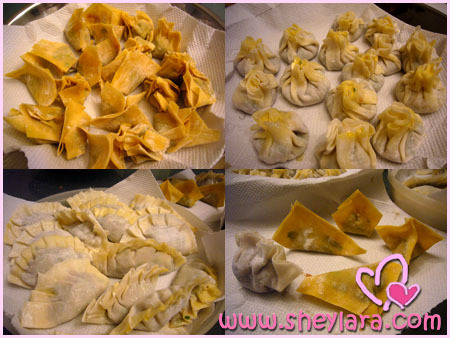 We made dumplings on National Day. 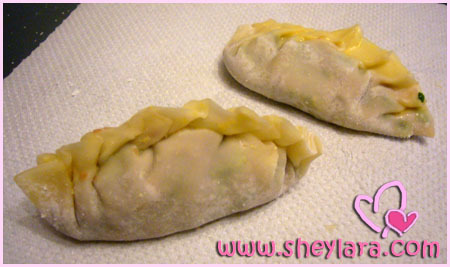 Or, rather, Cindy made the filling and allowed us to mess up her place wrapping the dumplings. We made a whole lot of assorted ones. I call them The Ugly Dumplings. I made three of these and just couldn’t get the hang of it, so decided to stick to the easier ones. But you know what? They don’t look too bad after being cooked. We had a feast! Cindy cooked a giant pot of Buddha Jump Over The Wall which is arguably the best I ever had. I drank five bowls of it!! Cindy is an amazing cook! Barely two hours after a super dinner, I made everyone go for durians. She was, of course, referring to the Esplanade, but she made me think of durians and that gave me a huge craving and I couldn’t stop thinking about it. 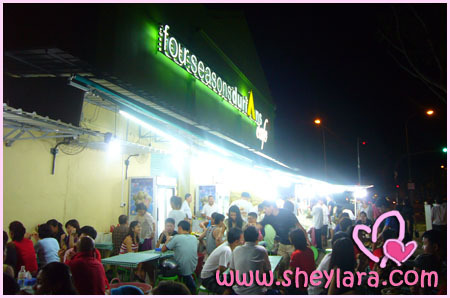 So, even before our dinner was properly digested, a few of us drove off to the Four Seasons Durians Cafe. The durians are freaking expensive but they are freaking awesome! We bought two XO D24 durians and two Cat Mountain King durians for $120 and that’s after a discount. Three of us shared most of it because Morte was having a sore throat and couldn’t eat too much. After eating Cat Mountain King durians, you don’t want to eat any other durians, ever!! Actually, I don’t know if it’s called Cat Mountain King. That’s a direct translation from Chinese. Don’t care lah. It’s damn nice and I died and went to heaven eating them. 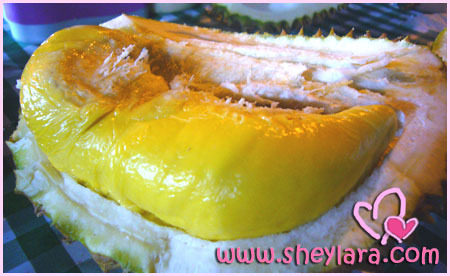 Here’s a nicely shaped durian which looks tough, but is so soft and creamy inside once you sink your teeth in it. Wang Wang and Unker Kell got so drunk with the joy of durian feasting that they started doing strange things with their durians. I was so full after all that durian!!! The CMK ones are especially potent because they’re very thick and creamy. And the nice durian uncle gave us a complimentary packet to bring home! Wow! I could eat durians every day!!! You may wanna take a look at this. $traits Times did a durian intro back in 2006. The dumplings look like curry puff. QY, is the takehome durian nice? Holy cow! US$85 for four durians?? What makes them different that ordinary run of the mill durians? thats an average of $40 per piece. wa u rich le! 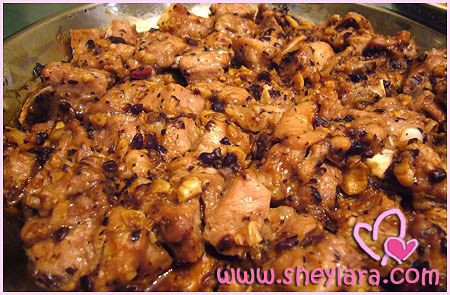 can eat $120 liu lian! think the ambassdor job is earning big bucks! I think the durians were charge by per kilo rite? Durians…..are nice….They are epic. TBH, wasn’t really interested in the fireworks. though, the smoke was a good change. NEA, are you reading this blog? Yummy Yummy!! I like durians too! Mince Pye: Price didn’t go up. It dropped actually. Just that 3 carrots went to get chopped! nadnut: Hehe… still waiting for our durian date, babe! JayWalk: Nice! Very useful article. Thanks for sharing! Wang Wang: Er… you know what, both of us haven’t had time to eat the durians yet, lol. Mince Pye: Prices are up in everything lah. abraxis: It’s in the taste and texture. The more expensive ones are creamier, fleshier, more fragrant, tastier. modchip: You’ve never tried a durian before? mamboberg: Er… anyone can afford to eat those durians wat. Each of us paid $40. That’s like the cost of a cheap handbag or pair of shoes. Just buy one less lor. I tend to spend more on food than on clothes or in fact any other thing. Haha. paced: Yup, the “branded” durians are usually charged by kilo. Wang Wang: I thought it was $15 for the D24? But doesn’t matter. Taste good can already! Haha. Ashtar83: lololol. Go Joo Chiat and smell lah. Damn power. The moment we stepped out of the car can smell already! Celine: Hi! Thanks for dropping by! Which casting did we meet at? Hey, all the best with your paper!! :) I can’t remember what link I posted already. But if you Google for “Word of the day”, you can actually find many sites providing this service. Good luck! Uh… you don’t have durians in the Philippines? I see. Do they grow durians there or are they imported? Oh, modchip’s from the Philippines too? I really should spend more time here in the comments instead of just lurking about. Yeah we grow our own durians here, but we don’t have those “premium” durians that you guys have, those must be really good (and not stinky!). Really? Usually not so fresh after so long liao.. I am impressed!! modchip: Wow, cool, you have a durian festival? I wish we had one in Singapore!! Btw, we went to eat durians again last night! Heheh! It was cheaper but not as nice. Wang Wang: Durain season is almost over!!! I think we gotta wait until next year before going ahead with our durian plantation trip to get the best durians!